I shop in Boots ... alot! But sometimes they don't have certain items that I want to get my hands on - and that's where Space NK comes in. I never knew this company existed. It wasn't until I started searching certain face creams and make ups online on Google Shopping that I saw it kept popping up. I also happened to notice on my frequent trips to Wagamama in St. Albans that there was a Space NK near it - I've yet to venture in - it's never busy and I hate going into an empty shop - it's awkward! I will admit - for certain products - they are quite expensive - things range from £5 to £300ish ... that's only what I've seen - there is probably more expensive products I've yet to discover on their website. I've picked a few items I've had my eyes on and that I'm planning to buy at some point when I have the spare pennies. They aren't too expensive and they come highly recommended by well-known beauty bloggers and YouTubers. I think I saw this when I was reading Tanya Burr's new book 'Love Tanya' - she said she really liked using it and that kept her skin full of moisture - as I have dry'ish skin I always look for a good face moisturiser that can help with that - so I'm planning to get this to try after payday. I've gotten into a habit of using a face mask once a week on a Sunday and I'm always on the look out for new masks to try. This was has popped up a few times and so I thought about trying it to see how I get on with it. I never knew that a good skincare routine included a 'serum' - I always just exfoliate, wash or moisturise. Many beauty bloggers/YouTubers do recommend a good serum within your routine. Again - I was reading Tanya Burr's book and she also uses a serum - I thought about trying the one she used but it was £125 and that's really out of my price range lol. So I had a look around Space NK and found this one which comes highly recommended by a few beauty bloggers that I read. They say you should always get 8 hours of sleep every night but I never do - I'm either up early writing a blog post, or editing a video for my YouTube channel or up early for work so I always look tired - so I try and get/use products to help me look less tired (and so people don't say 'oh you look tired') - I've tried different face creams, eye creams and some help and some don't - so I'm always on the lookout for new products to try and I saw this on a YouTube video a few weeks ago and I saw it on Space NK and I remembered I saw it - I think it was because of the name: 'Dragon's Blood' - obviously it isn't actually dragon's blood. I can't remember where I saw this eye cream. I think a beauty blogger must have featured a different product by the same brand and then I saw this product and it caught my eyes. As I touched on above the skin under our eyes is very delicate and we need to take care of it - which is why I'm willing to spend a little more on cream for my eyes in the hopes I don't look all old and horrid when I'm older. So this is a very well known brand within the beauty industry and from the reviews I have read it's does what it says on the tin. 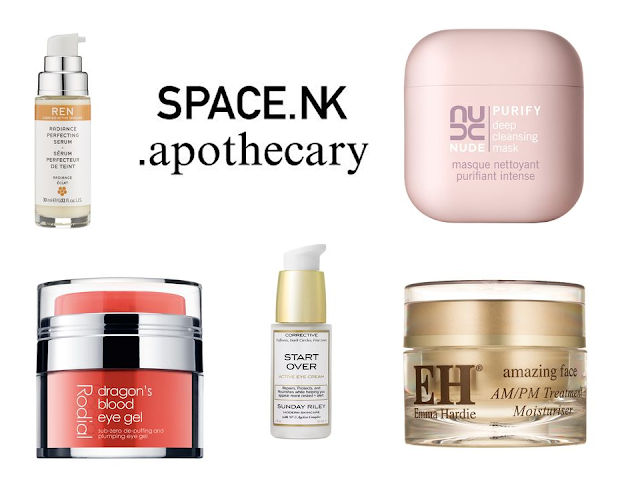 Have you ever shopped in/on Space NK? What did you think? Let me know in the comments below!